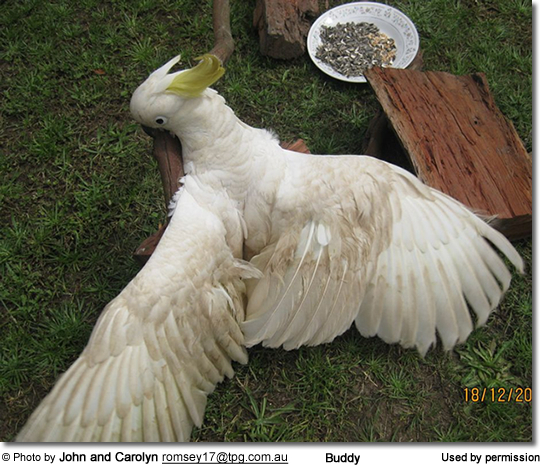 A friend of ours saved this cockatoo and another cockatoo from the side of the road. They had obviously been hit by a car and were both severely injured. Our friend took the cockatoos home and nursed them. 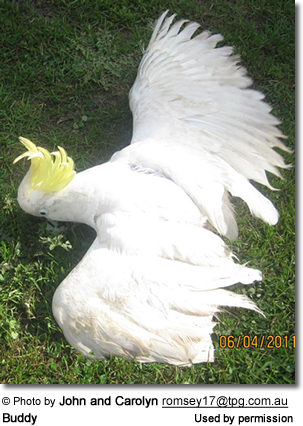 One of the cockatoos recovered after several weeks and our friend released the bird. The second bird had severely injured feet and had lost a couple of toes. He had sores on his underbelly and was in a bad way. After three months, he had vastly improved but did not appear to use his legs at all. Our friend became very busy at work and could not look after the bird any more and was thinking he would have to put the bird down. We visited our friend and when we heard the story and saw the bird, we immediately wanted to adopt it. We did adopt it four months ago now. 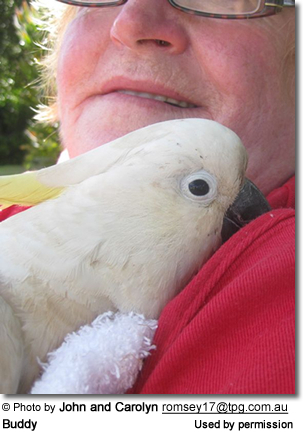 We believe it is a male cockatoo because his eyes are almost black. Females eyes are brown/red. 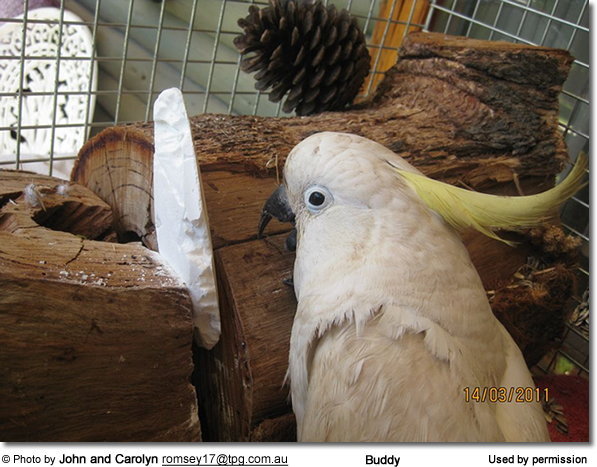 We brought the cockatoo home and named him Buddy. We built a lovely wide cage for Buddy to keep him safe from stray cats etc. He has a large wide log at one end of the cage and he sits on a smaller log covered in soft towels to protect his tummy. He did have sores and scabs on his tummy when we adopted him. I think his tummy has taken a long time to heal because he sits on his tummy as he cannot perch. 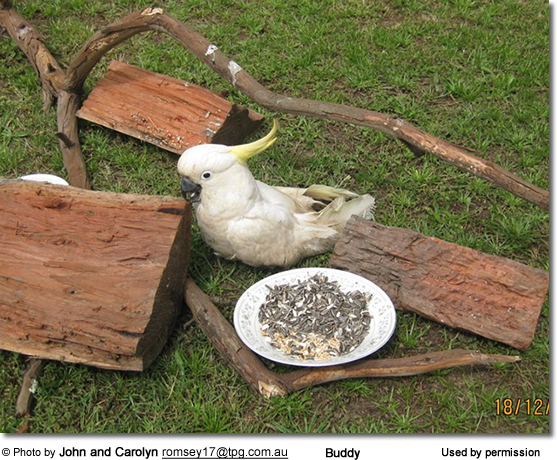 He loves to sit and pull the bark off logs with his beak, he can move over to his water tank by pulling himself along with his beak and spreading his wings to help him move along. We have put pine cones all along the walls of the cage and this helps Buddy move along the cage to get to his drink or his food. He loves to eat the sunflower seed bells we buy. He loves his mirrors, he has one at one of his cage (his family room) and the other end of the cage (his bedroom). Each night before sunset, we bring him in while we watch TV and he has his TLC time with his cuddles on my lap and I scratch him under his crest. He loves it. If I stop scratching him, he nibbles at my hand to scratch him some more. When we go out to him and talk to him, he seems to ge t excited and his yellow crest stands up on the top of his head. 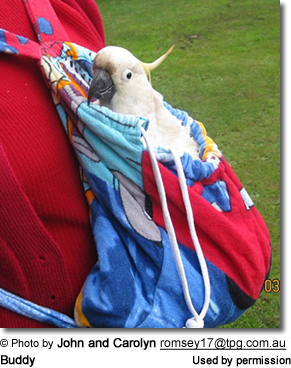 I try to take him for little walks, I hold him and put him near my shoulder and he looks around as I walk. He seems to like walking around with me. We have an acre of land in the country and I am certain he enjoys his walks. When it is a nice day, I take him out onto the back lawn and sit with him and he nibbles the grass and eats it. I think this must be good for him to eat the grass. I have tried to give him lettuce, apples, corn etc. but he doesn't attempt to eat it. However he does enjoy eating the grass or whatever is growing there at the time. He has a little cat's bed, a soft bed filled with foam rubber and I put a clean towel over this and this is little bed. I used to go out at dusk and put his bed in and place him in to his bed. This enabled him to get into a routine. Now I go out and put his little bed up the end of his cage, his bedroom and he even gets himself into bed when it is starting to get dark. 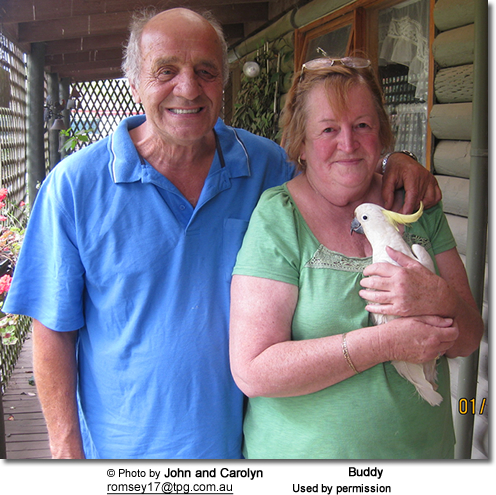 My husband and I feel very sorry for Buddy but feel he is not suffering, it is sad he cannot use his legs to perch and we feel he deserves to be loved and cared for because if we didn't care for him and set him free he would not survive for long. 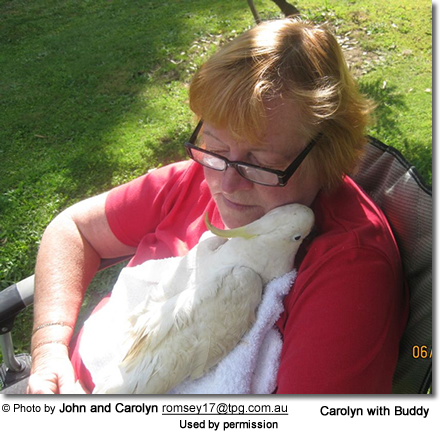 Carolyn states: " Buddy's tummy's sores have almost completely healed so I am not using towels all over the bottom of his cage any longer. We have purchased a roll of ripple rubber flooring which is soft on his tummy and can be wiped clean. 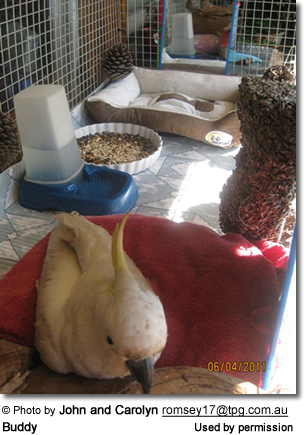 He still has towels and a soft cushion on top of his logs because he cannot perch and sits for hours on end on his tummy, we don't want his tummy to get sore. We have tied pine cones all around his cage, he grips onto the pine cones and spreads his wings and pulls himself forward. He still puts himself to bed in his little bed. When we first brought Buddy home, I used to bath his tummy in a weak solution of Betadine because I didn't want the sores on his tummy to become infected. I should mention that Buddy can fly for short distances but only at a little above ground level, his tail feathers are destroyed and do not seem to be growing again, maybe because he sits on his "tail" all the time." Buddy continues do do well. 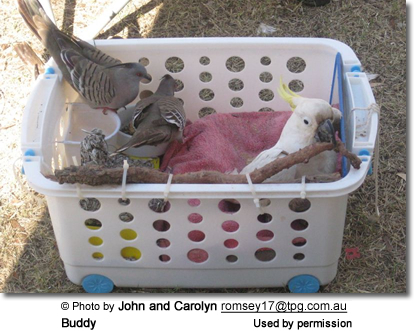 He spends most days on the back verandah in his large cage and each night before dinner his family brings him inside to spend the evening and night indoors with them. He has never really gained the use of his legs at all, one leg is continually tucked up tight against his tummy and the other leg he uses to rest on his knee, using his knee a lot to kneel and sit in his trolley inside or cage on the verandah. 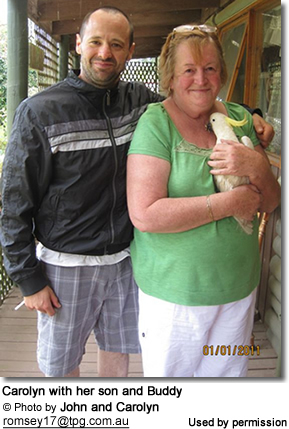 Last year, he traveled with his family for three months through most states of Australia. He enjoyed sitting in the middle of the seat.